Oak Ridge has an alternative school, which for some years served the purpose of being sort of the last stop before reform school. If students are expelled (usually for zero-tolerance offenses), they are usually permitted to attend the alternative school rather than just drop out. It still serves that purpose, but over the last few years, we’ve been moving toward making it truly an alternative — a place that also serves those students who, for whatever reason, just can’t function in the big, open environment at the high school. Beginning about a year ago, it also became home to our credit recovery program, whereby students who had failed classes necessary for graduation could make up those credits in an online format and still graduate on time. The alternative school is housed in the old Daniel Arthur building on Emory Valley Road. The facility was built as a school, but is in poor condition at this point, and not an optimal design for this purpose. The section of the building that houses the alternative school has exterior doors to each classroom; the plumbing is unreliable, and the electrical system is maxed-out. On the other hand, with completion of the high school renovations, we will have an entirely empty, reasonably new building adjacent to the high school campus within a few weeks. Designed as home to career and technical classes (what we used to call "vocational" until the term developed negative connotations), it’s a good facility. We no longer teach cosmetology or automotive repair at ORHS (now with health sciences, networking, CAD, and other subjects having taken their place), and the career-and-tech classrooms are integrated with the rest of the high school. As they should be. After a lengthy discussion last night (an hour and a half? ), we made the decision to move the alternative school to G Building, adjacent to the high school. There are three pages of solid reasons for the move, and only one that gives pause: will the closer proximity to ORHS (adjacent, actually) create any danger of students assigned to the alternative school for disciplinary reasons, mixing with the general student body? I believe that the answer is no. Roger Robinson, our alternative school principal, is a gifted educator with a calling to work with struggling and difficult students. Chuck Carringer, the ORHS principal, has proven himself at ORHS. Working together, I have absolutely no doubts that they will devise strategies to accomplish the necessary separation for those students who should be separate, while allowing access to both facilities for those who need it. It seems to me that the administration is attempting to make the Alternative School more convenient and attractive for the Alternative School students. However, the reality is that the Alternative School students have forfeited their rights when they took what ever action they took to get them placed into the alternative program in the first place. It’s great to try to provided the same level of education and educational atmosphere that the rest of the school has. However, that should not be done if there is the slightest concern for the rest of the students. First, what most people do not realize is that not all of the Alternative School students are there because of disciplinary reasons. Of those who are, most are there because they did something stupid — showing up at a school event under the influence, even just skipping school too many times. Some got caught with drugs. Some got frustrated and told a teacher to "f— off." A few are there for violent offenses, and they are receiving strong guidance in areas like impulse control in addition to their three R’s. Our students at ORHS, and society in general, will be safer if we do not abandon and fail these students. Furthermore, the credit recovery programs based in the alternative school are of benefit to ORHS students, some of whom are not now able to access them because they don’t have transportation to the Daniel Arthur building during the school day. I asked blunt questions last night, and I’m comfortable that my children (yes, my children attend ORHS) and yours will be not only safe, but safer, with the new arrangement. In preparation for increased math requirements in high school beginning in 2009-2010 (15 months from now), Metro Nashville Public Schools are dropping their 7th grade Algebra offering. Julie Martin, the district’s math coordinator, said parents should embrace the new changes. She said two years of middle school preparation are necessary for the new, more rigorous Algebra I curriculum requirements that roll out for 2009-10 — far tougher coursework than what’s tested on the current Gateway end-of-course exam. I’ve read and re-read the article, but the concept still doesn’t make sense to me. If the new Algebra I is going to be that much harder, perhaps they need to raise the standards required for admittance to the course in 7th grade, but to bar admittance entirely based on grade level seems foolish. Some kids are ready; some are not. However, keeping a student in a course that is too easy for their ability level fosters boredom and loss of interest, which is decidedly counterproductive. Different people — even children — have different interests, aptitudes, and abilities. Any given child may possess extraordinary abilities in one subject, while remaining rather ordinary in others. Some are advanced in all areas, and others struggle with everything but gym. I’ve wondered for a long time what it might be like to have school based upon mastery alone, rather than our current system of age-based progression. If we wish to raise the level of math competency in high school graduates — an entirely different conversation, but assume for the moment that we do wish to do this (because the state says we must) — would it not make more sense to allow those students who are ready for advanced material earlier, to do so? Some thought needs to be given to the core principle of enabling each student to reach their full potential, in whatever discipline that might be. We all talk about it, but sometimes, it seems like we’re going in the other direction. Postscript: Jackson Miller has an opinion on the subject. Along with the City Paper. Cathy’s been on my list of "good moms" for a variety of reasons, but this post adds another jewel to her crown. Her child missed a day of school for reasons beyond her control, and she was advised by the school to "just say that he’s sick" next time. In a day when attendance policies are already rigid enough to cause even the best parents some consternation, having the school tell parents to just lie about it is entirely counterproductive. See, it’s stuff like that that got us into the overbearing process of coding into policy how many sick days can be excused by parental note. Not all kids are the same — some are almost never sick enough to miss school, and some catch everything that goes around. Most moms develop the ability to discern the difference between a cold and bronchitis, or a 24-hour bug that will go away on it’s own and something more serious. Running to the doctor every time a child is under the weather overburdens local pediatricians’ offices, makes it harder for someone who’s truly in need to be seen quickly, and imposes a financial hardship on parents with inadequate or no health insurance. Such policies also encourage parents to send their kids on to school even when they are sick and contagious, putting others at risk in the process. I’m glad there are still parents like Cathy out there. All told, it makes everything work better — even fouled-up bureaucracies that think that everything can be regulated. ORHS is on the list again this year — but this is a list we definitely want to be on. The top two Tennessee high schools on the list are both magnet schools, operating on the same type of rigorous screening to admit only the most capable students. If Oak Ridge worked that way, we’d undoubtedly be way on up at the top of this list, too. But, that would deny opportunity to a significant number of students in this community… students who deserve a chance at the best teachers, who deserve the opportunity to stretch beyond the boundaries of what their parents achieved, or even what their parents think they can achieve. It provides some opportunity for students who took a little longer to mature academically, but by their junior or senior year, they’re ready to take on some really tough courses. Beta, graduating next week, doesn’t make anyone’s list of academic all-stars. She got a lottery scholarship on the basis of her ACT score (29), not her GPA (something less than 3.0). But she has performed quite well in some tough classes — AP Physics, AP Chemistry, and AP Calculus. It’s those other subjects that are bothersome to her — things like Wellness A, Civics, English — stuff that most people can breeze through — that nicked her GPA pretty badly. Basically, if it’s not interesting to her, she does only the minimum necessary to pass. I’ve tried explaining that this is not a good strategy, but… let’s just say she has an independent streak. One that she comes by honestly (and it’s not her dad who’s to blame). Anyway, I’m quite proud of Oak Ridge’s placement on the Newsweek list. I’m somewhat concerned that we’re falling in the rankings over the last five years, but we’re still only sixth of the 15 Tennessee schools in terms of the percentage of graduating seniors having passed at least one AP test — and that means they passed as juniors, since the scores from this year’s tests won’t be in until July or so. Three of the five above us are among those who admit only the best students to start with. That’s nothing to shrug off. Now, if only we can find a way to bring the rest of the student body up a notch, maybe we can reverse that trend for next year. 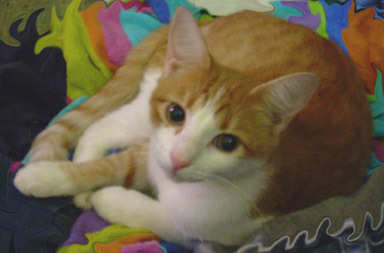 Creamsicle is Gamma’s little orange and white cat — the runt of the litter, that Gamma received as a birthday present from her godmother three years ago. Creamsicle is an adventurous little cat, frequently stalking birds, squirrels, mice, and even small rabbits in our yard. When she was not yet fully grown, we had to confine her to the house one spring, because she was darting down into a rabbit hole to steal baby bunnies. Yet, she does not leave the yard, and is decidedly more of a house cat than an outside cat. Yesterday evening when HWTFM went to pick Gamma up from a birthday party at Big Ed’s, Creamsicle had stowed away in his truck. She had probably hopped through an open window to enjoy the warmth sometime in the late afternoon. Unfortunately, when he got to Big Ed’s, the cat bolted as soon as he opened the door, running across Georgia Avenue through the parking lot and into the dense underbrush. He went to find Gamma first (tossing a football in the Blankenship parking lot), thinking that she could better call the cat than he. Unfortunately, too much time had gone by, and they had no idea where she went. Delta and I arrived a few minutes later, and we searched for an hour and a half, with no luck. Last night when I went to pick up Beta after work, Gamma and I searched some more — this time, with a flashlight, and with Dog (of whom Creamsicle is very fond). Shining a flashlight into the woods behind a house on West Geneva Ln., we saw two glowing eyes that seemed to respond to Gamma’s call, but they would come no closer. Gamma was ready to tear off into the ravine with a flashlight, but motherly instinct kicked in and I wouldn’t let her. Crawling around the woods in someone’s back yard at 11 p.m. is not a good practice; doing so when there’s an obvious steep gully is an even worse idea. After all, we could only see the glowing eyes. It might have been someone else’s cat or dog, a possum, a raccoon, a small fox… it wasn’t worth the risk in the dark. I’m pretty sure Gamma cried herself to sleep, but I promised that we’d look again this morning. And we did. The underbrush was quite dense and filled with poison ivy, but I started from the Tennessee Avenue side of the gully, while Gamma entered the woods from the Geneva Lane side. When I came to an old fence in the brush, I stopped to call the cat (I could have gotten over the fence, but it looked so old and brittle that I would have risked damaging it). After just a couple of calls, Creamsicle came trotting to me. I carried her back up to where the truck was parked on Geneva Lane, and we all came home happy. Except HWTFM, who’s a little miffed that we missed church to find the cat. 2 comments Sunday 18 May 2008 | Netmom | Etc. The Education Improvement Act of 1992 brought Tennessee’s change from mostly elected superintendents of schools, to a system of Directors of Schools appointed by the local school board. Although only three states still have any elected superintendents, bills to revert to such have been filed every year since 1992. I wrote about this a couple of years ago, and every word still applies. Why does it merit a second look? Because last Thursday, Rep. Frank Nicely (R-Knox and Jefferson Counties) tacked on an amendment to HB3857 that would have allowed elected superintendents in his two counties. That bill was tabled, so Nicely then tried to amend HB3455, only this time, a bunch more counties were included: Knox, Jefferson, Cumberland, Bledsoe, Roane, Union, Campbell, Washington, Meigs, Polk, Fentress, Morgan and Overton. Rep. Ulysses Jones’ motion to table the amendment failed, and it was only because the bill’s sponsor, Rep. Gerald McCormick, had previously agreed to refer the bill back to committee if any amendments were added that it didn’t pass on Thursday. There are still a few more days left in this year’s legislative session, and there are plenty more bills out there that could be amended. After all, HB3455 was about utility districts having the ability to form public building authorities, and HB3857 provides for contracts between local education agencies for use of one another’s facilities in the event of a disaster. I do wish they’d implement a rule to disallow tacking on unrelated amendments. This is the time of year, with only a few days of voting left in the Legislature, that serious mischief happens. The News-Sentinel has taken a stand against elected superintendents, as has the Tennessee School Boards Association. The only way to keep professionalism above politics in our schools is to call your state legislator and ask that they vote against any bill or amendment to allow elected superintendents. A little more professionalism in the Legislature wouldn’t be a bad thing, either. postscript: SchoolMatters is covering this as well. I think a poltergeist has taken up residence in our vehicles. Seriously. We — hubby and Beta, that is — made an unwise purchase of a too-used Honda Prelude several weeks ago. The kid who sold it to them said it needed the clutch adjusted, but when the adjustment failed, a reliable mechanic diagnosed the real problem: first gear is gone. And, it needs a couple of electronic sensors that total about $600, even from a junkyard. The total repair estimate was $2000 — 25% more than she paid for the car. The kid who sold it to them won’t take her phone calls, so we’re stuck with it. Caveat emptor. Beta worked a few more paychecks, diligently saving about $150/week, and she started looking around for another car. She found another on Craigslist, an older BMW, that had a good motor, good brakes, and a solid clutch. We bought it, but stopped at a mechanic on the way home to see about fixing the oil leak. Ack — $1,300 estimate on the oil leak, which the shop estimated at about a quart per day. Much worse than first thought. Fortunately, this guy was a good bit more ethical, and agreed to take the car back, since we’d had it less than an hour. Unfortunately, he’d already spent $200 of the purchase price, paying off his cell phone bill. I agreed to let it slide until he sold the car again (he’s a college student). So, we’re being a good bit pickier about used cars. Meanwhile, Alpha has arrived home, and has taken up driving the Suburban to work. Last Friday, she pulled over and called home when she noticed the smell of burning rubber, caused when the air conditioning compressor froze up and the serpentine belt was rubbing. So, off to the shop it went. Monday evening as Alpha and Hubby were bringing it home, his truck died along the way. It’s a 2002, with only 64k miles on it. So yesterday, it went to the shop. It ended up being something really weird, like the front brakes locked up, and the engine sensed too much load, and died whenever he let the clutch out. Or something like that. So, the last car standing was my mustang. Today I stopped at Advance Auto Parts for Beta to drop off a job application (she’s looking for a second job for the summer); when I tried to leave, nothing. No tick, no sputter, no map lights, no little bell that dings when the door is open. Ok, it still had the original Ford battery. Six or seven years is a long time. And, I was at an auto parts store, where the nicest young man was kind enough to take out my old battery and install a new one. Still, what are the odds of three perfectly good, working vehicles all going haywire within five days’ time? All during a time when both Alpha and Beta are looking to buy vehicles, and I’m having to run them all over the place. After looking high and low (mostly low, it seems), test driving junkers, and dealing with the whole gamut of car salesmen (from decent to slimy), Beta has decided that she’d rather spend her $1500 to get the Explorer fixed, and Alpha decided that Beta’s Prelude looks better than the stuff she’s finding on Craigslist for the same price or more. So, Beta’s going to get the Explorer fixed, and Alpha’s going to get the Prelude fixed, trading her futon and feather comforters to Beta in exchange. And, I think, there’s some scheme about Alpha helping Beta get to take over her job in three weeks, when Alpha leaves for her summer research internship at UGA. I’m beyond caring at this point. I just want the junk cars out of my driveway, and I’m tired of taxiing everyone around. So, if I’m a little cranky, there’s a reasonable explanation. Anyone up for an automotive exorcism? On Friday, we stopped by a couple of stores in the Briarcliff shopping center, on the way to a friend’s house. I noted to hubby that it sure would be nice to have a little shopping center like that — grocery store, liquor store, dry cleaners, asian restaurant — at the entrance to our neighborhood. Or even anywhere on our end of town. He replied that neighborhood shopping centers have mostly gone away, with all the successful stores clustered in the center of town. But it wasn’t always that way; I remember when Oak Ridge’s neighborhood shopping centers were very much alive and well. As a young child, I lived off Delaware Avenue; we bought most of our groceries at the Piggly Wiggly, right there in Elm Grove Center. Now, I think it’s a karate school and a consignment store… but I’ve lived on the west end for nearly 40 years. Part of the reason might be that in the 1960’s, fewer families had two (or more) cars. Neighborhood centers thrived as a result. Now, with fuel prices jumping a dime or more overnight on a regular basis, might there be a revived need for these neighborhood centers? From the vicinity of the Roane County line in Oak Ridge, the nearest grocery store is Kroger, about five miles away. A new grocery store on the west end of town would draw customers from half the town! Maybe not everyone’s business in its entirety, but they would surely get some business from the majority of west-end homeowners. Given the rise in gas prices, most people I know are trying to combine trips and drive less. I know that I am. While it’s painful, it’s also an opportunity for someone. 12 comments Monday 12 May 2008 | Netmom | Bored Housewife, Etc.